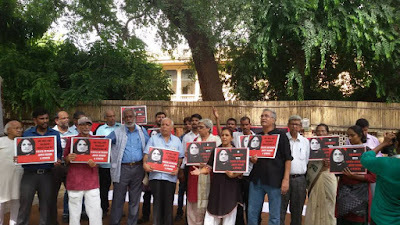 Demonstrations were held in different cities in solidarity with Teesta Setalvad, Javed Anand and their colleagues, with intellectuals, academicians, students, artists, activists, teachers and ordinary people coming out against the “blatant misuse” of state machinery to hound and persecute a group of courageous human rights defenders. 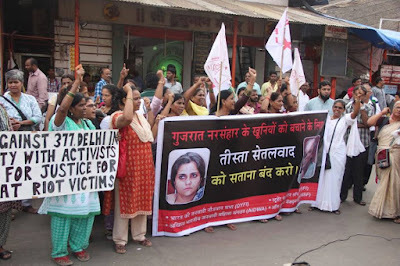 Those who participated in the demonstration at Jantar Mantar in Delhi included activists from All-India Democratic Women’s Association, Jan Natya Manch, Jamia Teachers’ Solidarity Association, National Federation of Indian Women, No More Campaign, Shahri Adhikar Manch, Anhad, and United Christian Forum. Yet, she insisted, the “intention” of the Gujarat police has been to “somehow secure the custody of Setalvad and Anand”. She added, the latest raids only show frustration of the Central officialdom following intervention of the Supreme Court not to arrest Setalvad and others. 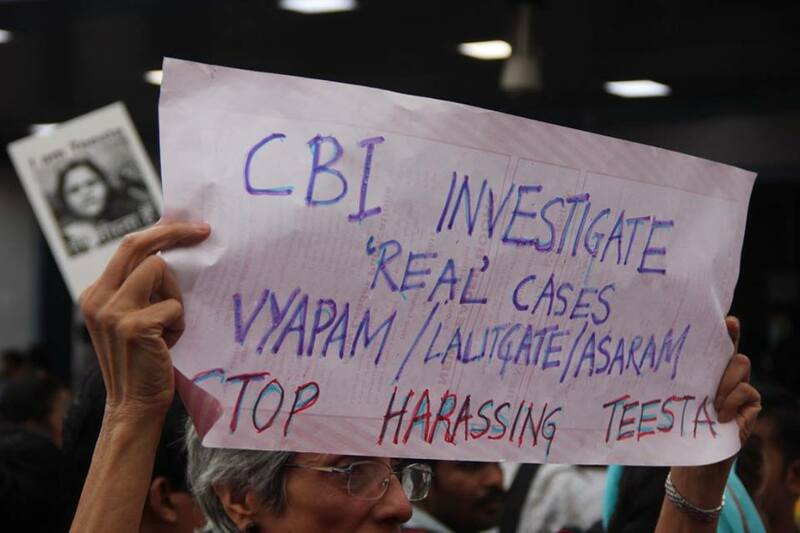 “The Gujarat government mobilized the Ministry of Home Affairs, which has in turn unleashed the CBI on the activists”. “It is appalling that while multi-million scams and the ruling party’s coziness with scamsters awaits investigation, the Central government is witch hunting activists. The reasons are obvious: Setalvad and others must be made to pay for the relentless pursuit of justice in the 2002 massacre of Muslims”, Hashmi said. “It is well-known that Setlavad and Anand have fought to expose the role of the Gujarat government in enabling, abetting and even organising these crimes. They have been fearless in charging the then Chief Minister Narendra Modi, who is currently Prime Minister, with direct criminal culpability for these crimes”, Hashmi said. “For this they have assisted the widow of a former MP who was slaughtered in the carnage Zakia Jafri to fight a brave court battle in which the first accused is the then Chief Minister Narendra Modi. They are also appealing against court orders to free on bail prominent political leaders of the BJP convicted of the worst massacre in Naroda Patiya, Maya Kodnani and Babu Bajrangi”, she pointed out.